Sir Pelham Grenville Wodehouse (1881 - 1975) was an enormously popular and prolific writer who produced about 100 books over 70 years. In Jeeves, the ever resourceful 'gentleman's personal gentleman', and the good-hearted young blunderer Bertie Wooster, he created two of the best known and best loved characters in twentieth century literature. Wodehouse was part-author and writer of some fifteen plays and 250 lyrics for some 30 musical comedies. The Times hailed him as a 'comic genius recognized in his lifetime as a classic and an old master of farce'. He was created a Knight of the British Empire in the 1975 New Year's Honours List. According to 'P.G. 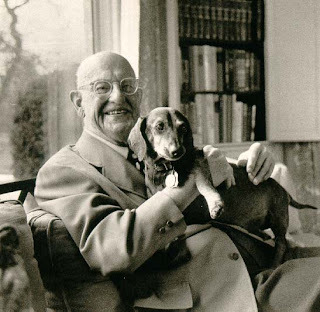 Wodehouse: A Portrait of a Master,' his dachshund's name was 'Jed.' He seemed to be quite the animal lover and was often photographed with his pets. Read more about P.G. Wodehouse at wikipedia. Longfellow Wins Savannah Wiener Dawg Races!